Osteomyelitis is inflammation of the bone caused by an infecting organism. Although bone is normally resistant to bacterial colonization, events such as trauma, surgery, the presence of foreign bodies, or the placement of prostheses may disrupt bony integrity and lead to the onset of bone infection. Osteomyelitis can also result from hematogenous spread after bacteremia. When prosthetic joints are associated with infection, microorganisms typically grow in biofilm, which protects bacteria from antimicrobial treatment and the host immune response. Early and specific treatment is important in osteomyelitis, and identification of the causative microorganisms is essential for antibiotic therapy. The major cause of bone infections is Staphylococcus aureus. Infections with an open fracture or associated with joint prostheses and trauma often must be treated with a combination of antimicrobial agents and surgery. When biofilm microorganisms are involved, as in joint prostheses, a combination of rifampin with other antibiotics might be necessary for treatment. The bony skeleton is divided into two parts: the axial skeleton and the appendicular skeleton. The axial skeleton is the central core unit, consisting of the skull, vertebrae, ribs, and sternum; the appendicular skeleton comprises the bones of the extremities. The human skeleton consists of 213 bones, of which 126 are part of the appendicular skeleton, 74 are part of the axial skeleton, and six are part of the auditory ossicles. Hematogenous osteomyelitis most commonly involves the vertebrae, but infection may also occur in the metaphysis of the long bones, pelvis, and clavicle. Vertebral osteomyelitis usually involves two adjacent vertebrae with the corresponding intervertebral disk. (See the image below.) The lumbar spine is most commonly affected, followed by the thoracic and cervical regions. Osteomyelitis of T10 secondary to streptococcal disease. Photography by David Effron MD, FACEP. Posttraumatic osteomyelitis begins outside the bony cortex and works its way in toward the medullary canal, typically found in the tibia. Contiguous-focus osteomyelitis often occurs in the bones of the feet in patients with diabetes mellitus and vascular compromise. For more information about the relevant anatomy, see Skeletal System Anatomy in Adults and Osteology (Bone Anatomy). 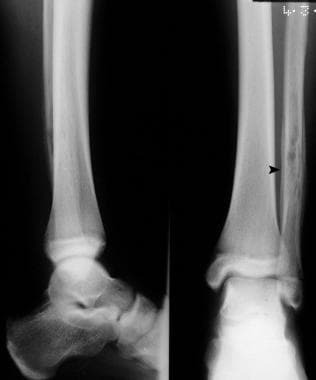 The initiating factor in contiguous-focus osteomyelitis often consists of direct inoculation of bacteria via trauma, surgical reduction and internal fixation of fractures, prosthetic devices, spread from soft-tissue infection, spread from adjacent septic arthritis, or nosocomial contamination. Infection usually results approximately one month after inoculation. Infection is most often caused by minor trauma to the feet with multiple organisms isolated from bone, including Streptococcus species, Enterococcus species, coagulase-positive and -negative staphylococci, gram-negative bacilli, and anaerobic organisms. Foot ulcers allow bacteria to reach the bone. Patients may not experience any resulting pain, because of peripheral neuropathy, and may present with a perforating foot ulcer, cellulitis, or an ingrown toenail. Physical examination may reveal decreased sensation, poor capillary refill, and decreased dorsalis pedis and posterior tibial pulses. Treatment is aimed at suppressing infection and improving vascularity. However, most patients develop recurrent or new bone infections. Resection or amputation of the affected tissue is sometimes necessary. Debridement, incision and drainage, and tendon lengthening are attempted first. Potential sources of infection include skin, soft tissue, respiratory tract, genitourinary tract, infected intravenous sites, and dental infections. S aureus is the most common isolated organism. However, Pseudomonas aeruginosa is more common in intravenous drug users. In children with subacute focal osteomyelitis (see the image below), S aureus is the most commonly isolated organism. Rarefaction and periosteal new-bone formation around the left upper fibula in a 12-year-old patient. This was caused by subacute osteomyelitis. Gram-negative bacteria such as Pseudomonas species or Escherichia coli are common causes of infection after puncture wounds of the feet or open injuries to bone. Anaerobes can also cause bone infection after human or animal bites. Osteomyelitis in the neonate results from hematogenous spread, especially in patients with indwelling central venous catheters. The common organisms in osteomyelitis of the neonate include those that frequently cause neonatal sepsis, namely group B Streptococcus species, and E coli. Infections in the neonate can involve multiple osseous sites, and approximately half of the cases also involve eventual development of septic arthritis in the adjacent joint. Children with sickle cell disease are at an increased risk for bacterial infections, and osteomyelitis is the second most common infection in these patients. The most common organisms involved in osteomyelitis in children with sickle cell anemia include Salmonella species, S aureus, Serratia species, and Proteus mirabilis. The incidence of spinal osteomyelitis was estimated to be 1 in 450,000 in 2001. 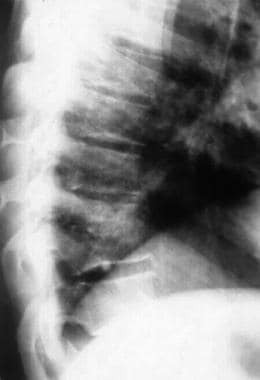 In subsequent years, however, the overall incidence of vertebral osteomyelitis is believed to have increased as a consequence of intravenous drug use, increasing age of the population, and higher rates of nosocomial infection due to intravascular devices and other instrumentation. [13, 14] The overall incidence of osteomyelitis is higher in developing countries. Inadequate therapy may lead to relapsing infection and progression to chronic infection. Because of the relative avascularity of bone, chronic osteomyelitis is curable only with radical resection or amputation. These chronic infections may recur as acute exacerbations, which can be suppressed by debridement followed by parenteral and oral antimicrobial therapy. Rare complications of bone infection include pathologic fractures, secondary amyloidosis, and squamous cell carcinoma at the sinus tract cutaneous orifice. [Guideline] Concia E, Prandini N, Massari L, Ghisellini F, Consoli V, Menichetti F. Osteomyelitis: clinical update for practical guidelines. Nucl Med Commun. 2006 Aug. 27(8):645-60. [Medline]. Gross T, Kaim AH, Regazzoni P, Widmer AF. Current concepts in posttraumatic osteomyelitis: a diagnostic challenge with new imaging options. J Trauma. 2002 Jun. 52(6):1210-9. [Medline]. Newman LG, Waller J, Palestro CJ, Schwartz M, Klein MJ, Hermann G. Unsuspected osteomyelitis in diabetic foot ulcers. Diagnosis and monitoring by leukocyte scanning with indium in 111 oxyquinoline. JAMA. 1991 Sep 4. 266(9):1246-51. [Medline]. Calhoun JH, Manring MM. Adult osteomyelitis. Infect Dis Clin North Am. 2005 Dec. 19(4):765-86. [Medline]. Paluska SA. Osteomyelitis. Clinics in Family Practice. 2004. 6:127-56. Shaw BA, Kasser JR. Acute septic arthritis in infancy and childhood. Clin Orthop Relat Res. 1990 Aug. 257:212-25. [Medline]. Vincent GM, Amirault JD. Septic arthritis in the elderly. Clin Orthop Relat Res. 1990 Feb. 251:241-5. [Medline]. Courjon J, Lemaignen A, Ghout I, Therby A, Belmatoug N, Dinh A, et al. Pyogenic vertebral osteomyelitis of the elderly: Characteristics and outcomes. PLoS One. 2017. 12 (12):e0188470. [Medline]. [Full Text]. Peltola H, Pääkkönen M. Acute osteomyelitis in children. N Engl J Med. 2014 Jan 23. 370 (4):352-60. [Medline]. Belthur MV, Birchansky SB, Verdugo AA, et al. Pathologic Fractures in Children with Acute Staphylococcus aureus Osteomyelitis. J Bone Joint Surg Am. 2012 Jan 4. 94(1):34-42. [Medline]. Walter G, Kemmerer M, Kappler C, Hoffmann R. Treatment algorithms for chronic osteomyelitis. Dtsch Arztebl Int. 2012 Apr. 109 (14):257-64. [Medline]. [Full Text]. Beronius M, Bergman B, Andersson R. Vertebral osteomyelitis in Göteborg, Sweden: a retrospective study of patients during 1990-95. Scand J Infect Dis. 2001. 33(7):527-32. [Medline]. Digby JM, Kersley JB. Pyogenic non-tuberculous spinal infection: an analysis of thirty cases. J Bone Joint Surg Br. 1979 Feb. 61(1):47-55. [Medline]. Tseng CH, Huang WS, Muo CH, Kao CH. Increased risk of dementia among chronic osteomyelitis patients. Eur J Clin Microbiol Infect Dis. 2015 Jan. 34 (1):153-159. [Medline]. Hassan AS, Rao A, Manadan AM, Block JA. Peripheral Bacterial Septic Arthritis: Review of Diagnosis and Management. J Clin Rheumatol. 2017 Dec. 23 (8):435-442. [Medline]. Jordanov MI, Block JJ, Gonzalez AL, Green NE. Transarticular spread of Ewing sarcoma mimicking septic arthritis. Pediatr Radiol. 2009 Apr. 39 (4):381-4. [Medline]. Jaramillo D, Dormans JP, Delgado J, Laor T, St Geme JW 3rd. Hematogenous Osteomyelitis in Infants and Children: Imaging of a Changing Disease. Radiology. 2017 Jun. 283 (3):629-643. [Medline]. [Full Text]. Bernard L, Lübbeke A, Stern R, Bru JP, Feron JM, Peyramond D. Value of preoperative investigations in diagnosing prosthetic joint infection: retrospective cohort study and literature review. Scand J Infect Dis. 2004. 36(6-7):410-6. [Medline]. [Guideline] Expert Panel on Musculoskeletal Imaging:., Beaman FD, von Herrmann PF, Kransdorf MJ, Adler RS, Amini B, et al. ACR Appropriateness Criteria® Suspected Osteomyelitis, Septic Arthritis, or Soft Tissue Infection (Excluding Spine and Diabetic Foot). J Am Coll Radiol. 2017 May. 14 (5S):S326-S337. [Medline]. Palestro CJ. Radionuclide Imaging of Musculoskeletal Infection: A Review. J Nucl Med. 2016 Sep. 57 (9):1406-12. [Medline]. [Full Text]. Abiri MM, Kirpekar M, Ablow RC. Osteomyelitis: detection with US. Radiology. 1989 Aug. 172(2):509-11. [Medline]. Howard CB, Einhorn M, Dagan R, Nyska M. Ultrasound in diagnosis and management of acute haematogenous osteomyelitis in children. J Bone Joint Surg Br. 1993 Jan. 75(1):79-82. [Medline]. Wheat J. Diagnostic strategies in osteomyelitis. Am J Med. 1985 Jun 28. 78(6B):218-24. [Medline]. Crymes WB Jr, Demos H, Gordon L. Detection of musculoskeletal infection with 18F-FDG PET: review of the current literature. J Nucl Med Technol. 2004 Mar. 32 (1):12-5. [Medline]. [Full Text]. Howard CB, Einhorn M, Dagan R, Yagupski P, Porat S. Fine-needle bone biopsy to diagnose osteomyelitis. J Bone Joint Surg Br. 1994 Mar. 76(2):311-4. [Medline]. Waldvogel FA, Medoff G, Swartz MN. Osteomyelitis: a review of clinical features, therapeutic considerations and unusual aspects. 3. Osteomyelitis associated with vascular insufficiency. N Engl J Med. 1970 Feb 5. 282(6):316-22. [Medline]. Cierny G 3rd, Mader JT, Penninck JJ. A clinical staging system for adult osteomyelitis. Clin Orthop Relat Res. 2003 Sep. (414):7-24. [Medline]. Gordon L, Chiu EJ. Treatment of infected non-unions and segmental defects of the tibia with staged microvascular muscle transplantation and bone-grafting. J Bone Joint Surg Am. 1988 Mar. 70(3):377-86. [Medline]. Ger R. Muscle transposition for treatment and prevention of chronic post-traumatic osteomyelitis of the tibia. J Bone Joint Surg Am. 1977 Sep. 59(6):784-91. [Medline]. Weiland AJ, Moore JR, Daniel RK. The efficacy of free tissue transfer in the treatment of osteomyelitis. J Bone Joint Surg Am. 1984 Feb. 66(2):181-93. [Medline]. Kelly PJ. Infected nonunion of the femur and tibia. Orthop Clin North Am. 1984 Jul. 15(3):481-90. [Medline]. [Guideline] Berbari EF, Kanj SS, Kowalski TJ, Darouiche RO, Widmer AF, Schmitt SK, et al. 2015 Infectious Diseases Society of America (IDSA) Clinical Practice Guidelines for the Diagnosis and Treatment of Native Vertebral Osteomyelitis in Adultsa. Clin Infect Dis. 2015 Sep 15. 61 (6):e26-46. [Medline]. Zalavras CG, Patzakis MJ, Holtom P. Local antibiotic therapy in the treatment of open fractures and osteomyelitis. Clin Orthop Relat Res. 2004 Oct. (427):86-93. [Medline]. Lázaro-Martínez JL, Aragón-Sánchez J, García-Morales E. Antibiotics versus conservative surgery for treating diabetic foot osteomyelitis: a randomized comparative trial. Diabetes Care. 2014. 37 (3):789-95. [Medline]. [Full Text]. Zimmerli W, Widmer AF, Blatter M, Frei R, Ochsner PE. Role of rifampin for treatment of orthopedic implant-related staphylococcal infections: a randomized controlled trial. Foreign-Body Infection (FBI) Study Group. JAMA. 1998 May 20. 279 (19):1537-41. [Medline]. [Full Text]. Louie KW. Ilizarov method. West J Med. 1991 Aug. 155(2):170. [Medline]. Rosenfeld SR. The Ilizarov method. West J Med. 1995 Dec. 163(6):568. [Medline]. Gateley DR, Irby SJ, Martin DL, Simonis RB. Ilizarov bone transport for the treatment of chronic osteomyelitis: a rare complication. J R Soc Med. 1996 Jun. 89(6):348P-50P. [Medline]. [Full Text]. Krappinger D, Irenberger A, Zegg M, Huber B. Treatment of large posttraumatic tibial bone defects using the Ilizarov method: a subjective outcome assessment. Arch Orthop Trauma Surg. 2013 Jun. 133 (6):789-95. [Medline]. Osteomyelitis, chronic. Image in a 56-year-old man with diabetes shows chronic osteomyelitis of the calcaneum. Note air in the soft tissues. Osteomyelitis, chronic. Three-phase technetium-99m diphosphonate bone scans (static component) show increased activity in the heel and in the first and second toes and in the fifth tarsometatarsal joint. Osteomyelitis, chronic. T1- and T2-weighted sagittal MRIs show bone marrow edema in L1 and obliteration of the disk space between L1 and L2.